A rolling walker has many uses whether you’re recovering from surgery or just having trouble getting by due to age or muscle weakness. 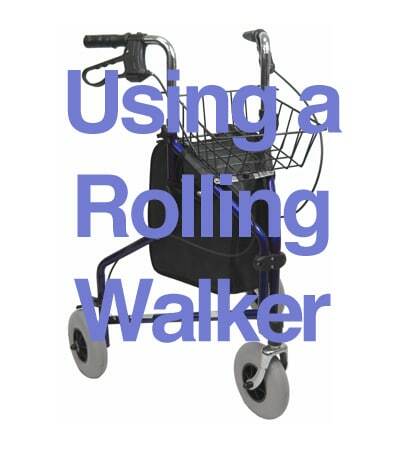 A rolling walker helps by aiding your balance and reducing the amount of strain going to your legs tremendously. Any situation that can cause dizziness or fatigue can be much less frightening with a rolling walker because there is always a sense of security since you can always reach forward and grab your walker if you were to ever lose your balance or stumble. Rolling walkers aren’t only for assisting with balance however. Nearly fifty percent of individuals use rolling walkers for support. If you’re using your walker as support, walk with your hands in front of your body, pushing the walker forward as you get closer to it. Remember not to lean on the walker as that is not the intended use of the device. When using a walker to support your weight, it’s best to keep your walker still as you step forward. This helps with stability and prevents loss of balance. Always keep your back upright when pushing your walker since this helps prevent the walker from getting too far in front of you. Also make sure to never use your walker on steps. Walkers are designed for flat surfaces only. If you need to walk up and down stairs, try switching to a cane for that specific reason. Try not to hurry or take large steps, especially if you are significant disabled and have trouble with balance. Your rolling walker should be specifically chosen and adjusted to your height. It should be high enough to allow you to stand up without being too far up from the handlebars. Elbows should be bent about 20 degrees to allow precise movement and turning.